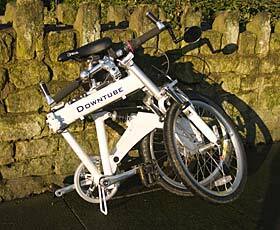 Over the last few months (ie early to mid 2006) a number of people have emailed us asking us about Downtube folders, apparently having seen them on the internet/eBay. Until recently we haven't been able to provide any comments, but we have now had an opportunity to test the IX FS model. Downtube market a range of folders in North America, including models with 16 inch and 20 inch wheels, some with front or full suspension, and ranging in price from $299 to $589 (prices late November 2006) The IX FS we tested has 20 inch (406) wheels, front and rear suspension, and, in the form we tested it, a 9-speed derailleur gear system; the price listed for this model in the USA is $359 ($30 less with an 8-speed derailleur). 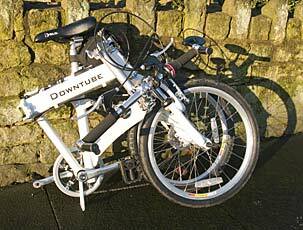 I asked Downtube to let us have this model to test as it seemed around the specification of machine I would be most interested in, and therefore would be able to test most effectively, though of course other models may well be of more interest to other readers. These are very attractive prices - there are some very basic folders around for less, but such machines do generally tend to perform in line with their price, so in testing the Downtube we were particularly interested to find out whether they were this type of machine, or whether they offered a cheaper alternative to some better known makes of decent folder. 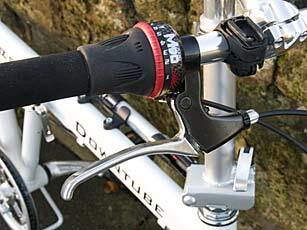 Downtube don't seem to be represented in the UK at present, and list a shipping cost of $190 (including VAT) to the UK. This is of course does quite significantly increase the price, but even so the final price is very attractive - we will make a couple of comparisons at the end of this report. Our views can of course only cover the model we tried - this model should be one of the best specified, but on the other hand the fact that it is a full suspension model does introduce some practical problems as well (weight, folded size, lack of mudguards and lack of luggage capacity). Singe 46 tooth chainring; no provision for fitting a front derailleur. The ring looks to be replaceable, though the spider is apparently just swaged to the crank, not an integral part of it. Most of the components are either unfamiliar brands, or anonymous, but generally seem of good quality and perform well (see details later). The Downtube arrived in a sturdy cardboard box measuring. Inside the box the bike was extremely well packed, with cardboard around almost every individual frame tube. The bike was folded, with the seat post removed, the handlebar stem removed, and the handlebar extensions (standard!) turned through 90 degrees. Assembly was quite simple as it was little more than a standard fold - it took longer to remove all the packing! The test bike was finished in white, with polished metal components. A small adjustment to the derailleur cable, and some air in the tyres, was all that was required before riding. The seat height is easily adjusted using a quick release; the seat post is not calibrated, so once you have found the right height, an indelible marker is useful to allow the seat to be returned to this height after unfolding. The saddle ('Plush') is mounted on a conventional micro-adjust, making it quite easy to adjust the angle and fore and aft position. Handlebar height is also adjustable - an excellent feature, though as the stem is not keyed, you need to make sure that the bars are correctly aligned after adjustment. The instructions suggest lowering the bars to their minimum height when folding - I'm not sure this is really necessary, and I had the bars at their minimum height anyway. 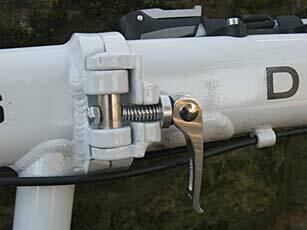 An adjustable forward extension is fitted, so that in addition you can angle it up or down, which means the reach can be adjusted (excellent, and something which is rare as a standard fitting even on far more expensive bikes). I found the reach a little long, even with the saddle fully forward, but it would be easy to replace the stem with a shorter unit. The frame etc is almost entirely aluminium, and the test bike was finished in white, which looks very smart, but of course does tend to show dirt etc (the bike is also available in orange and in black, the latter only for the 9-speed version though). The steerer and its hinge mechanism are painted silver, and all the other components, apart from the rear mech and twist grip, are polished. The frame has a sturdy hinge in the cross bar, with a very positive double locking mechanism (details in the section of folding below). A similar catch is fitted to the hinge on the forks which allows the steerer/stem/handlebars to be hinged down. The suspension results in the cross bar being a bit higher than on some folders - if you are choosing a small-wheeler because of problems getting on and off a large-wheeled bike this might be an issue, but it's not going to be important for most people. The frame looks well-made and strong, and certainly showed very little sign of any kind of flexing. Bottle bosses are an unexpected but very welcome feature of the frame; the position, on top of the rather high cross bar might mean that a bottle cage is a bit in the way when mounting and dismounting, but even if you decide against mounting a bottle cage, these mounts are very useful for securing a small pump. 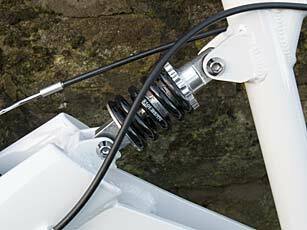 This is a full suspension folder, with a 'Zoom' front fork and a mechanical spring rear shock. The spring in the rear shock is quite stiff, but the preload can be adjusted. I reduced the preload to a minimum, and the result for me was fairly firm but acceptable stiffness. None of the other testers, almost all of whom were heavier, including several much heavier ones, passed any comment on the setting, so it could probably be just a shade less stiff and still satisfy heavier riders. 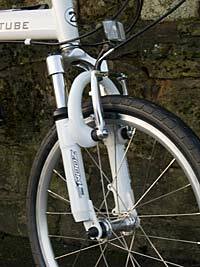 Personally I found it more acceptable than the very stiff rear spring on my 2005 Dahon Jetstream P8, which I find unpleasantly stiff, and which has produced a similar reaction from heavier riders. When stationary and leaning on the front of the bike, the front suspension feels as though it might be a bit soft, but on the road and moderate off-road tiding it feels just right. All the other testers seemed happy with it as well. There is no apparent means for adjusting the front suspension. The front forks have mountings for a disk brake unit. I think that it is Mike Burrows who has described tyres as 'annular air and rubber suspension units' - anyway, I will cover tyres under the suspension heading. The test bike was fitted with Kenda tyres front and rear, the front being marked as a Kwest, but the rear giving no model designation. The front tyre is 1.5in wide, the rear is 1.75in. The front tyre has a pronounced tread, what me might think of finding on a medium touring tyre, while the back tyre has a more pronounced tread, though by no means a knobbly. They proved excellent on this bike - on the road, even at the relatively low rated 65psi, the rolling resistance felt low, and as good as some tyres which run at higher pressures and with less tread pattern. Off road, on tow paths and cycle tracks, the extra tread was very welcome, and made riding more pleasant than on may of my small wheelers which are equipped with tyres which don't have as much tread, and are consequently quite skittish on rough or slippery surfaces. Schrader valves are fitted to the tubes - I prefer Prestas generally, but for the lowere pressures these tyres run at, and the market sector, the Schrader is probably a sensible choice. 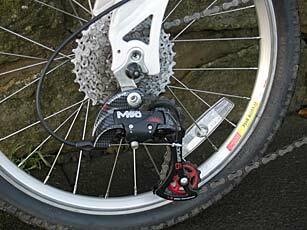 The test bike was fitted with the optional 9-speed derailleur system (an 8-speed is standard). The cassette is an 11-32 tooth type - nicely spaced an almost the maximum range available. At the front there is a single 46-tooth chainring, giving a gear range of about 29-86 inches. This seems to me an ideal choice - young strong riders and/or those living in flat areas might prefer slightly higher gearing overall, but I think this is a good choice, and if you take account mild off-road aspirations, suggested by the full suspension design, the choice of this range seems appropriate. At the front the ring is interchangeable, so if you did wnat to raise or lowser the overall gearing, this should be relatively easy, though in so doing the twin plastic chainguard rings would probably have to be removed, or at least would be less effective. Although the ring can be changed, the crankset is the one part of this bike which looks rather cheap, though it performed alright on test. 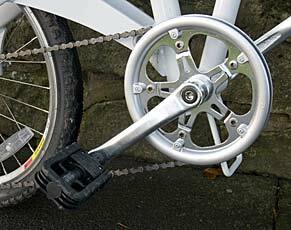 A single ring, with no derailleur at the front, can often result in a tendency of the chain to come off frequently when riding - somthing which small-wheelers seem to suffer from particularly when coupled to many sprockets at the back. Chainguards at the front can help in this respect, but I've had bad experiences with several such designs in the past. Happily this is not an issue with this Downtube - the chain remained firmly in place at all times. The rear mech and twist-grip are marked as Juju M90 - I've never heard of this make, but it seemed well made, and the smoothness and precision of changing was as good as (or sometimes better) than better-known makes; in a relatively short test I can't of course draw any conclusions regarding longevity. The rear mech has a long arm, with a surprisingly large lower jockey wheel. V-brakes are fitted front and rear, with nice levers on the bars, adjustable for reach, and with wear-adjusters in the usual place on the levers. As with most bikes, the brake shoes needed to bed-in, and the rims needed to do the same, but once this had occurred, the brakes felt perfectly adequate, and were easy to control. One tester, who tried the bike before the running-in was complete, thought the brakes were a bit 'wooden', ie not much feedback in terms of lever movement as pressure was increased on the levers, but I think that this was partly due to the fact that the blocks had not yet bedded in, and also it is a not uncommon feature. A fancy way of referring to the saddle, pedals, handlebars etc! The saddle fitted to the test bike was marked 'Plush'. It is a fairly basic item, but not uncomfortable, and while I might change it on a bike of my own, it was quite acceptable for the test period, including some rides of over 50Km. 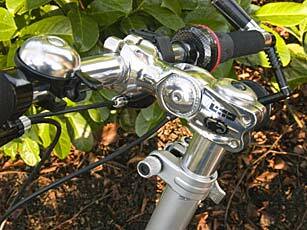 It is fitted on a micro-adjust stem, so it is easy to adjust the angle and lateral position. The seat post has a good range of adjustment - I'm quite short, at about 5ft 6in, but there was about 12cm more upward height adjustment available, so I'd expect it to be quite comfortable for people well over 6ft tall. There was also plenty of downward adjustment available, though the young son of a neighbour did have to have it at the lowest position, and was a bit stretched even then. The folding pedals (both pedals fold) are a fairly standard design - push in along the spindle and twist to fold them. They felt fine in use, and the locking is very positive, though I'm not sure about their life, especially in harsh use. The bike came with no tools or pump (of course almost no bikes are so equipped nowadays), but there was a small generic manual (not specific to this model, and with some inappropriate and sometimes odd recommendations). A bell and reflectors were fitted (rear reflector was loose in the bag for the owner to fit) - nowadays I think these are a requirement, though a Birdy I bought new recently was supplied without most of these! It is really excellent to find bottle bosses on a bike like this - many folders which more aspirations to long-distance riding have no means of mounting a bottle cage. 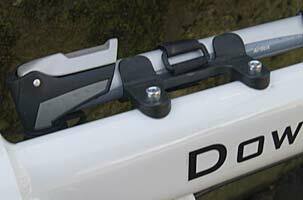 Even if you do not want to fit a bottle cage, these mountings can be very useful for mounting mini-pumps etc. The position is perhaps not ideal, on top of the 'top tube', as, since the top tube is relatively high for a small wheeler (due to the suspension) it makes stepping through the frame more of a problem with a cage fitted. However, top marks for providing the bosses, when so many other machines don't. Now to what I see as the only two weak areas, and they are ones which are generally a problem with full suspension bikes - mudguards and luggage carrying. No mudguards are fitted to the bike, and in fact there is almost no means to add them later. At the rear, there are a couple of potential mounting points near the dropouts, but no forward mounting point at all. A crud-catcher could be attached to the seat post, but would be even less effective than on a large-wheeld mountain bike, as it would be so far from the small wheel, and would interfere with lowering the seat post when folding. At the front there is no provision at all for a mudguard - I not sure if some of the units sold for conventional mountain bikes could be adapted in some way. Riding on a damp road during the test period resulted in a very wet bum, and I would have to find some form of solution to be able to live with this. However, I suppose it should be pointed out that a large proportion of 'normal' bikes are no better in this respect. My 2005 Dahon Jetsteam P8 also lacks mudgaurds, and Dahon did not list any to fit it, thoyugh mounting points ere provided, and I was able to fit mudguards intended for a Grasshopper recumbent. Aftrer mudguards, the other criticism is luggage carrying, or lack of it. Again there is no way to mount a conventional rack, though one of the seat-tube0-mounting units could be used (again this would obstruct lowering the seat post when folding). The best solution I would adopt personally would be to use a conventional saddlebag or a Carradice SQR mount/bag - the latter might also catch some of the muck and water for which there is no protection at the back from a mudguard. 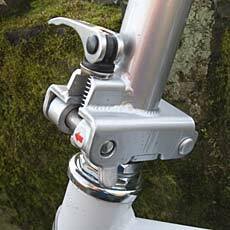 While these do not hinder the initial lowering of the seatpost when folding, they do tend to limit the extent to which the post can be lowered, resulting in a more bulky folded package. As this model is not intended as a tourer, the fact that luggage handling is poor, and a saddlebag type solution would still limit the amount of luggage may well not be that important - it is really only the fact that the bike performed so well that it might easily be considered for more serious long-distance cycling that raises the issue - which is something of a compliment! 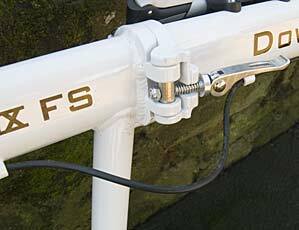 Folding of the Downtube is very straightforward, and very similar to a Dahon. The sequence is not particularly critical, and you do not need to put the machine in any particular gear prior to folding. The process is typically: Lower the seat post, fold the pedals, release the frame hinge-joint and fold the frame, then release the handlebar joint and fold the bars down. If you have the bars particularly high, you might need to lower them (using the quick release mechanism) before lowering, but I did not need to do this. The frame and stem quick releases are very positive and incorporate a safety mechanism. To release these, you first open a conventional quick-release lever, then pull the release lever to one side, which releases a sprung pin which fits into a mating hole. 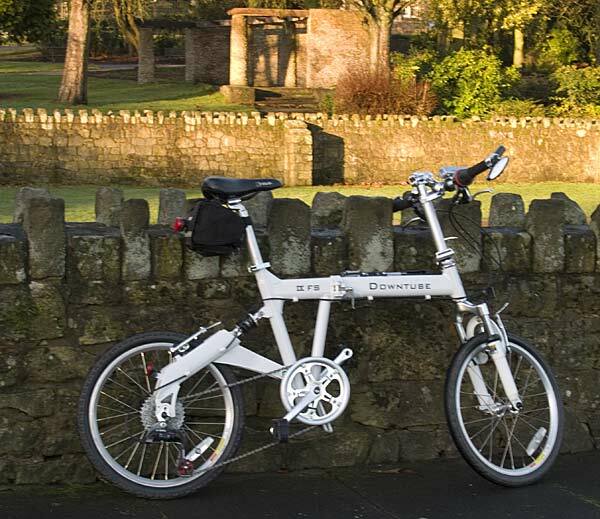 Although the folded package is bigger than a Brompton or Birdy, and a shade larger than some Dahons, the simplicity of folding is to be welcomed, and in fairness it should be pointed out that the size is probably larger than some of the other Downtube models due to the suspension. Unfortunately there is nothing to hold the folded package together, though in practice it does tend to stay folded reasonably well if you have forgotten to bring a strap to put round it, as I did on one occasion. The test bike came with a smart bag, which would provide reasonable protection to the bike for land transport, though not enough for taking it by air. I* didn't actually use the bag, as it is moderately bulky and heavy to carry when riding, and there is nowhere to carry it easily on the bike ( I hate back packs). Personally I prefer a light, thin cover which can be thrown over the bike to hide it, and which is easy to carry; however, I did fall foul of this solution on a recent train journey to Edinburgh, when another passenger with a large amount of luggage to stow inspected what was already in the luggage rack, identified my luggage as a folded bike, and persuaded the train manager to insist that I move it!! Unfolding the bike is simply a reversal of the folding process, though setting the seatpost height will be more awkward if you have not marked the correct position on the tube (like most folders, the tube does not have any embossed markings on it to help in this respect. If you did lower, or remove, the handlebar stem you will also need to position this correctly One minor annoyance is that when you unfold the bike the gear cable forms a loop near the hinge, which needs to be straightened before riding (the new 2006 Birdy models also suffer from this problem, but to a much greater extent). When folded, the bike is fairly heavy to carry, but it is possible to position it so that you can wheel it along on one of the main wheels when folded - slightly awkward, but better than carrying it. On top of this, the folding process is sufficiently easy and quick that it will normally be left until the last minute (assuming there is no need to go to the extra effort and time of bagging). Getting on and off this model one is conscious that the 'top tube' is a little higher than on some folders, due to the suspension design, but unless you have a particular problem in this respect it is unlikely to be an issue. The frame feels very stiff (ie no undesirable flexing in the frame or stem area). The ride quality both on road and light off-road is good, and the suspension is effective for riders of a variety of sizes and weights. The riding position can be easily adjusted to suit rider size and tast, and it should be possible for most people to be comfortable on this bike. 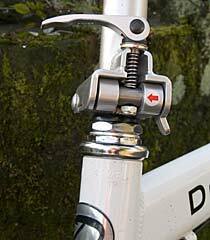 I was slightly stretched for reach, though angling the adjustable stem up or down mostly solves this, and the top part of the stem could quite easily be replaced if necessary to reduce the reach more. The bike was extremely free-running, especially for such a modestly priced machine. The gear range is well chosen and the gear change operated smoothly and positively. The brakes do all that is required of them in an effective and efficient way. Folding and unfolding is simple and quick, though, partly due to the suspension on this particular model, it is not particularly small when folded, and is not especially light either. The only drawbacks noted with this particular model are the absence of mudguards, and any easy way to fit them, and lack of luggage mounting. For some these may be important issues, though partial solutions may be possible, and it is worth restating that these relate to the fact that this particular model has front and rear suspension, and so are not relevant to some of the other models in the range. This Downtube is available at an excellent price in North America, and even with shipping to the UK (there is no local distributor) the price is attractive. There are cheaper folders on the market, but many of these really are dreadful, and would give many people a dislike of folders, and perhaps cycling as a whole. This Downtube feels a quality machine, and was a pleasure to ride. The choice of components seems very good - not well-known names, but apparently good performers. This is no Brompton in terms of size when folded, but the folding process is easy and quick, and though no lightweight, moving the folded machine is not too much of a problem as it is possible to use one of the wheels to roll it around on. Whenn unfolded, the performance is very good indeed for a relatively cheap folder - or indeed by other higher standards. When I'm asked to avdvise people on what folder to buy, I always start with the old adage that it is 'horse for courses (and riders)' - the choice depends on how you plan to use the folder and your own features and preferences. If the features of this Downtube fit your requirements profile, I can certainly recommend this machine on the basis of our test, especially at this price. I have experience of owning two other full-suspension folders from better-known companies that cost 2-3 times the price, and this Downtube is better in SOME (but of course not ALL) respects than either. While it is perhaps not my 'favourite' folder for my particular requirements, I could certainly live with it very happily as my only folder if the need arose. Downtube can be found on the web at http://www.downtube.com.